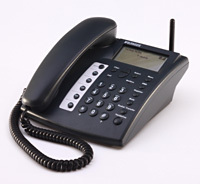 Witura WT-2006 3G Desktop Phone also enables instant telephone access to various applications like providing a landline alternative for remote areas, ships, vehicles, construction, oil and mining companies, exhibitions, disaster recovery application services or any temporary sites. Witura 3G Fixed Wireless Phone with SIM card slot, voice call function, and also support for providing 3G High-speed Internet access to your device like laptop or desktop computer via USB connection. Low cost option for users requiring a GSM Gateway/Fixed Cellular Terminal, but want to use a headset. This bundle includes a WT-1018 single sim GSM Gateway, a NRX Evo Headset Phone and a Agent Soho Monuaral Headset. The P355 includes many features that are not available on ordinary handheld phones but are essential to efficient phone communications. For example, Burnside Easy Call Transfer allows incoming calls to be transferred by the user to any other phone. Handsfree answering, headset and call recording options provide convenience in a very wide range of applications. Microsoft TAPI compatibility allows power dialling from computer-based applications.